Thanksgiving: where family, fun, and food are a given. But so is the inevitable turkey coma. Why does our body react this way to the food on the Thanksgiving dinner table? 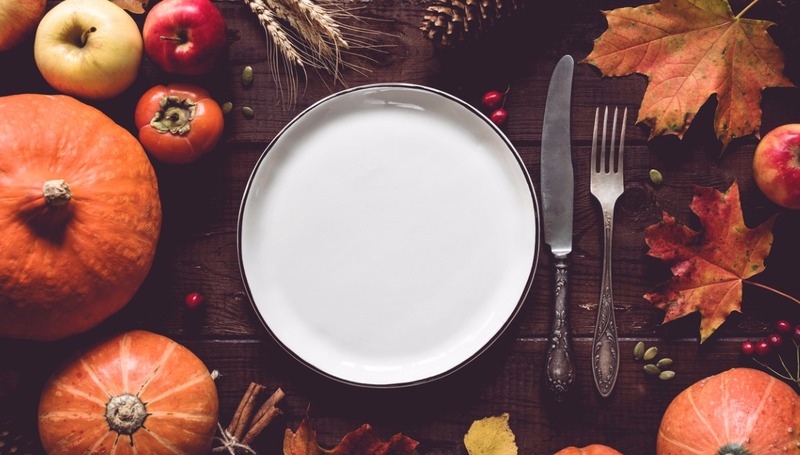 We’re going to break down the different foods that may be featured in your spread, and how each one negatively or positively impacts your holiday. _Previously on our blog, we talked about the importance of seasonal superfoods; the produce items that really pack a nutritional punch during the fall and winter growing season. Cranberries are one such food, and however you choose to incorporate them into your meal (jellied or compote), their anti-inflammatory properties are sure to be of use in the food battle to come. _On Thanksgiving day, you’ll be putting your digestive track through its toughest run of the year. Every family approaches bread a bit differently, but if you choose to use white bread, keep in mind that it is low in fiber, which means it takes longer to digest. It takes a lot of energy to digest the gum-like substance that bread turns into. If you can’t bear to part with a fresh, warm roll, try whole-grain bread instead, which is ultimately better for you and tastes just as good. Now, if rolls aren’t your family’s thing, corn bread might be your other option. However, corn bread isn’t the healthiest. Corn bread contains large amounts of fat, sugar, and sodium, depending on how you make it. If you can’t bear to part with this dinner addition, we’ve found a recipe that ensures your corn bread is both good for the soul and the stomach. _Potatoes are high in fiber, protein, and starch, but when you mash them up and add butter or milk, calorie count increases, and saturated fats and cholesterol outweigh the benefits. If you still want to enjoy the warmth of a side of ‘taters, try leaving the skin of the potatoes in to not only maintain some of that natural fiber, but to add texture to your dish as well! If you’re considering skipping the extra starch but still crave the mashed potato taste, there are many recipes for cauliflower mashed potatoes , which are lighter, healthier, and are an oh so tasty substitute. _One recommendation for a healthier Thanksgiving, is to make sure you’ve got plenty of color on the table. This color should come from a variety of fresh veggies that will provide that stream of nutrients throughout the meal. Take a break from carbohydrates and instead fill up on vitamins, and anti-inflammatory agents. We’ve hand-picked a few recipes that are sure to be hit. *Pst: these could also be a substitute for your mashed potato side dish! _We’ve always been told that the aftermath of a full, Thanksgiving meal is to feel tired and ready for a long nap. It was said that the amino acid, tryptophan, in turkey was the cause – but this isn’t entirely true. While your turkey certainly is a contributing factor to the after-meal nap, the true reason we feel so sluggish, is that you are filling your body with carbohydrate-heavy foods. Your body needs time and energy to break down and digest the feast, and that can leave you feeling ready for some ZZZs. While your turkey doesn’t have enough tryptophan to be the sole culprit for your after-dinner snooze, it does have vitamins and minerals to spare. While dark meat has more of . There are plenty of health benefits linked to the consumption of turkey, and you can learn more about them at MedicalNewsToday . _Delicious and oh-so-starchy! While stuffing can be high in antioxidants (i.e. pronyl-lysine, which exists in high concentrations in bread crust), depending on how you make it, it can have – you guessed it – high amounts of calories. However, there is lots to love about this side. Using healthy grains can boost the contents of fiber, vitamins, and minerals, while the addition of onions, carrots, celery, and herbs make for a deliciously nutritious dish. This stuffing recipe from Cooking Light has never steered us wrong! _Whether apple, pumpkin, or pecan, a sugary dessert can’t be far from the empty gravy-boat. Luckily, the base for traditional Thanksgiving pies are typically healthy – apples and pumpkin are good for you no matter how you slice it – it’s the extra baking components that can overwhelm your sweet tooth and your full stomach. The addition of spices like cinnamon, nutmeg, and allspice have the added benefit of aiding in digestion and being anti-inflammatory. Which, after a large meal, might come in handy. Enjoy your dessert, but if you’re already full after the meal, don’t force yourself to eat, no matter how tempting the dessert. Just remember that leftovers are always nice, and if you really can’t wait to take a bite after dinner, try to reduce the amount of added toppings like whipped cream or ice cream. If you want to reduce the side effects of the main feast, be sure to limit snacking throughout the day and drink plenty of water instead of pop or alcohol. As always, maintain portion control and don’t overdo it! While this meal only comes once a year, it can still be enjoyed with moderation and healthy meal-prep. We at Bright hope you have a wonderful and happy Thanksgiving!